Above is a finer grained jpeg of the graphic printed in this Monday's Mainichi Shimbun. Just click on the image to open the jpeg to its full size. For reference, it appeared in the morning edition, pages 14-15. Though it is not clear who produced this image, the special edition's listed authors are Itō Tominaga, Sudō Takashi and Suzuki Hideo. I have degraded the image by shrinking it and cutting a number of holes in inappropriate places. These acts of vandalism should be sufficient to handle potential copyright issues while preserving the image's value as an academic resource. Please see Mainichi's jpeg for the original appearance. I am not sure I would agree with the original classification of Ōe Kenzaburō as a liberal who later moved left -- but then I am not an intellectual historian (You are not any kind of historian - Editor). I also think the glossing-over of Sakurai Yoshiko's transformation (she's way down in the far lower right corner - apt once you think about it) from easy-going Westernized moderate to helmet-headed militant is...unfortunate. Having a lot on one's plate keeps one from committing acts of serious cogitation. So in line with yesterday's recommendation of Peter Tasker's essay I will recommend a few more thought pieces by friends and acquaintances as I put off writing my rant about Slate's misleading article on the sōshoku/nikushoku divide (first, Fukusawa did not invent the terms and second, since when is an episode of a television talk show ever been evidence of a cultural shift?) or a slightly calmer piece on whether the July 12 Tokyo municipal elections should be considered a referendum on Asō Tarō's tenure as prime minister or not. Anyway, devilishly handsome Yokota Takashi has been writing essays for the revamped Newsweek to good effect. For the June 22 edition he outlines some of the most compelling of the reasons why it is unlikely the government of Japan will take even tiny steps toward developing nuclear weapons, no matter the dreams of U.S. neoconservatives. Over at the Far Eastern Economic Review Ulrich Volz discusses the remarkably steady progress toward the creation of a robust financial safety net for the economies of East and Southeast Asia. We do not hear much about these initiatives, despite the GOJ's being not only being proactive but working in close cooperation and enjoying equal billing with China. Then again, the lack of scenes of embarrassment or rancor is probably the reason we do not hear much about these initiatives. Herr Doktor Volz has also recently sent me the book on the subject that he edited with Koichi Hamada and Beate Reszat, which I am reading in spurts. If you did not get a copy of yesterday morning's edition of the Mainichi Shimbun, then you missed a keeper. The cover article discusses the Fujisaki apology, a topic which until now has been actively ignored by the press. The cover story and a companion article on page three also examine how revisionist writings and activities have impacted Japan's relationship with the United States. One idea that emerges from the reading: that the burst of right wing revisionist writing from the late 1990's and early naughts made it almost imperative for the Japanese government to issue apologies, meaning that the fantabulists' attempt to reawaken a sense of stubborn, defensive, unapologetic pride (hokori) in Japan's history backfired...completely. Good work guys and gals of the right. On the inside, in color, across two pages, is a graphic showing the taxonomy, genealogy and evolution of writers critical of Japan's relationship with the United States. The graphic resembles Richard Samuels' famous diagram in Securing Japan showing the ebbing, flowing, mixing and disappearance of intellectual currents controlling Japan's foreign policy. Given the subject matter, I would venture a guess that the authors of the Mainichi adapted Samuels' illustration to fit their purposes. I have my copy... and I am keeping it. Peter Tasker has written a must-read essay for the Financial Times on the negative lessons one can draw from the bursting of stockmarket and real estate Bubble in 1989. It is both frustrating and thrilling to see someone else hammer out a fundamental truth one could sense but could never find the words to describe. How Does Asō Tarō Do It? I mean it, how does he do it? How does he, in a greeting to a party election office in Bunkyō Ward, say "the candidate you are helping is assured of losing by a narrow margin" (sekihai o ki shite) when he wanted to say "the candidate you are helping is assured of victory" (hisshō o ki shite)? Does he feel a desperate need to provide fodder for an otherwise bored-to-tears press corps? At this point, bad luck is just following the prime minister around, biting him in the keister with impunity. The man needs a rest. We all do. A fortuitous caveat at the conclusion of this post, it seems. The weekly magazine Shukan Shinchō seems to have fingered Ishii Hajime, a Democratic Party of Japan vice-president, to be the heretofore unnamed politician who asked Muraki Atsuko's division to "look after" the fraudulent Rin-no-kai handicapped postal services scheme. That the ultimate persuasion came from a DPJ legislator makes the whole story more comprehensible, from a prosecutorial standpoint. Director-generals and directors find it necessary to do favors for politicians -- i.e., pay special attention to a particular constituents or organizations -- all the time. It is part of the grease that keeps the wheels of government turning. To go after Muraki, one of the very few woman DGs, for a crime politicians expect bureaucrats to commit, when there is no evidence of the her having received anything of personal value in return for the favor, would require the prosecutors be damn sure that no one would jump on them for carrying out a sexist, selective prosecution of a prominent working women's benefits advocate. Which would seem to be the case here. The DPJ will say nothing because Ishii is one of their own. The Communists and Socialists will say nothing because they are allied with the DPJ in the House of Councillors. The members of the ruling coalition will say nothing, lest this little drama bring exposure to their own past and present massive misuse of bureaucratic favors. No mess, no fuss, no noise. Very clean. Ishii Hajime (he's the one behind Ozawa in the photo here) is one of the Diet's truly odd birds -- and I mean that in a positive way. The son of the president of Mercury Records Japan (and later, a 3-term Hyogo Prefecture assemblyman) he received his B.A. degree in political science from UCLA in 1958, then a Master's in the same field from Stanford University in 1960. After a lengthy stint at the Japan Productivity Center, he ran for a House of Representatives seat for the first time in 1967. A second attempt in 1969, however, was successful. He served until 1983, when he lost his seat. After two and a half years as a rōnin, as he puts it, he won his seat back again, only to lose it again in 2003. Saved from a departure from the House of Representatives by having been doubled listed as both a district seat candidate and a party list candidate, he washed out of the House of Representatives for good in the DPJ wipeout in 2005. In 2007, however, he moved up to the House of Councillors, winning a spot in the anti-Abe LDP election as a DPJ party list candidate. A varied career, documented with rare openness in a slick, simple website (yes, he is a Stanford grad). Pity it should be tarnished at this late date by possible involvement, however innocuous, in a petty fraud. Later - OK, after at gander at the magazine's wording, a correction. Ishii is not claimed to have put the request to Muraki herself. I have changed the above text to reflect this version of events. How an idea circles the world at the speed of dumb. By HYUNG-JIN KIM – SEOUL, South Korea — North Korea may fire a long-range ballistic missile toward Hawaii in early July, a Japanese news report said Thursday, as Russia and China urged the regime to return to international disarmament talks on its rogue nuclear program. The missile, believed to be a Taepodong-2 with a range of up to 4,000 miles (6,500 kilometers), would be launched from North Korea's Dongchang-ni site on the northwestern coast, said the Yomiuri daily, Japan's top-selling newspaper. It cited an analysis by the Japanese Defense Ministry and intelligence gathered by U.S. reconnaissance satellites. The missile launch could come between July 4 and 8, the paper said. Will North Korea Fire a Missile Toward Hawaii? by Noriko Namiki - North Korea may be preparing to launch a long-range ballistic missile, possibly in the direction of Hawaii, a Japanese newspaper said Thursday, citing an analysis by the Japanese Defense Ministry. By Dan De Luce – WASHINGTON — The US military has moved additional defenses to Hawaii in case North Korea launches a missile towards the Pacific island chain, Defense Secretary Robert Gates has said. For all you lazy [expletive deleted]s, would it kill you to provide some context and analysis? Is it not proper to ask why the Japan Defense Ministry would think a rocket might be fired due East from the Dongchangri or Mudanri sites, overflying Aomori Prefecture, heading in the direction of Hawaii? Could it be, just maybe, because firing a rocket due East makes maximum use of the rotation of the Earth to boost the distance the rocket travels? And could it be important that when a missile is fired due East from North Korea, the path of least energy twists southward (when one looks at a flat map) toward the open waters of the Pacific, paralleling the Hawaiian Island chain? And could it be significant to note that there is very little shipping traffic in out in the waters southwest and even less in the waters southeast of the Hawaiian Islands, making these zones as good a place as any to safely splashdown a rocket? Or to emphasize that in the original JDM analysis, the Hawaii route was considered most likely because transited the fewest sovereign air spaces and posed the least threat to heavily inhabited regions? Or that even in the lackadaisical AP report, the Taepodong is noted to have insufficient range to reach Hawaii? And might it be important that the sea-based radar Secretary Gates is ordering to sea to contribute to Hawaii's defense has Honolulu as its homeport...and that the Department of Defense caught flak for not ordering the radar out to sea to monitor the last DPRK missile test? As for the initial report in Yomiuri Shimbun, the Vice Minister of Defense refused to comment on it yesterday. WASHINGTON (CNN) -- Defense Secretary Robert Gates said the United States could defend itself in the event of a North Korean missile launch toward Hawaii, and that U.S. officials were monitoring the situation carefully. 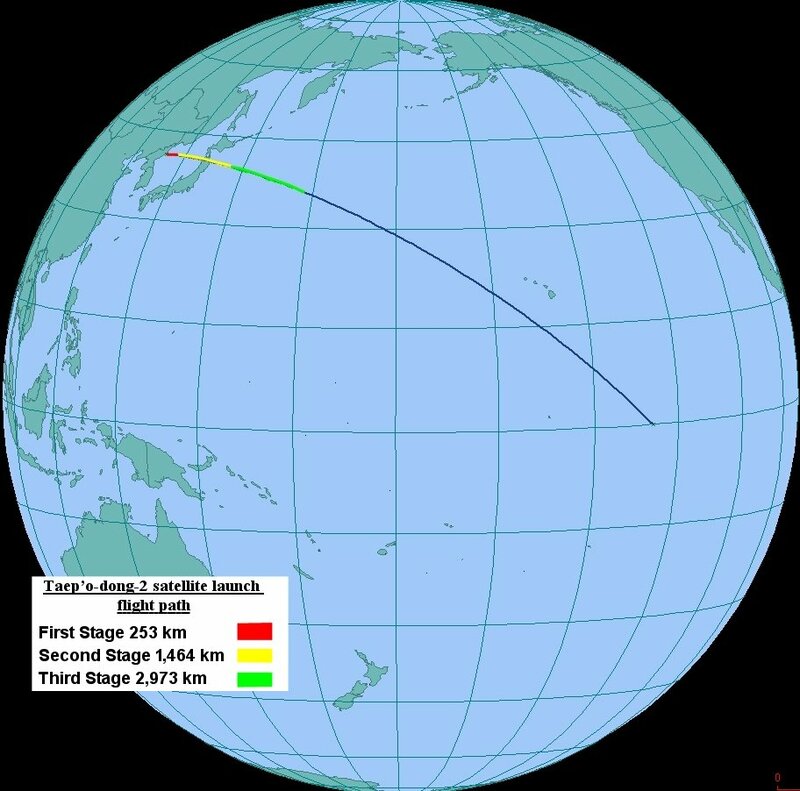 According to Japanese media Thursday, North Koreans are preparing to make such a launch. Yesterday's vote total in the House of Councillors on the resolution calling for the elimination of nuclear weapons. "As the only country to have suffered a nuclear bombing, and in aiming for the elimination of the world's nuclear weapons, our country has spearheaded the submission of resolutions calling for 'Nuclear disarmament for ultimate abolition of the nuclear weapons' to the United Nations General Assembly since 1994. We feel we have an obligation to continue presssing forward with this action. However, in this post-Cold War present, the threat posed by the dissemination and proliferation of not just nuclear weapons but missiles capable of bearing nuclear warheads, nucleonic materials and nuclear technologies has grown steadily higher. In order to break out of this situation, the President Obama of the United States declared the decision to pursue a 'World without nuclear weapons' on April 5 last. Moreover, United Nations Security Council has shown a posture of obdurate rejection of the nuclear tests of the Democratic Republic of North Korea in UN Security Council Resolution 1874, et al. We must take advantage of this situation and should work together with the nuclear weapons states and the non-nuclear weapons states to ensure an effective inspections regime to grapple with the reduction and non-proliferation of nuclear weapons. Moreover, the government should seize this opportunity to fulfill a leadership role at Nuclear Non-Proliferation Treaty (NPT) review conference in 2010 and appeal to the international community, starting with the nuclear weapons states, to quickly bring into force the Comprehensive Nuclear Test Ban Treaty (CTBT) as well as implementation of the Fissile Material Cut-Off Treaty, and by other acts work to further strengthen its efforts toward the non-proliferation, reduction and total elimination of nuclear weapons. Tamogami Toshio, Nishimura Shingo, still wrong. Translation by MTC from the resolution text available on the Kahoku Shimbun website. In a Kyōdō poll conducted over the weekend, the percentage of voters supporting the Cabinet was found to have dropped to 17.5%, down 8.7 points from a month ago. A Mainichi poll also conducted over the weekend found 19% support for the Cabinet, a fall of 5 points from a month ago. As for the always peculiar "Who is the most appropriate person to be prime minister?" question, Democratic Party of Japan leader Hatoyama Yukio received 50.4% of the votes in the Kyōdō poll, with only 21.4% supporting the PM. The Mainichi poll had a smaller gap, to 32% for Hatoyama and 15% for Asō -- but the Asō number represents a 6 point fall from only a month ago. Allegiance to the opposition Democratic Party of Japan over the ruling Liberal Democratic Party showed a staggering, unprecedented gap, with 38.5% for the DPJ versus 19.8% in for LDP in the Kyōdō poll. In the Mainichi poll the gap was smaller, 34% of respondents saying they are pro-DPJ versus 20% pro-LDP. However, an astonishing 47.8% of respondents in the Mainichi poll claimed they were going to vote for the DPJ's candidates, while only 18.7% expressed an intent to vote for LDP candidates. No politician I, but it looks like the ruling coalition's decision to delay the dissolution of the Diet until after the Tokyo Municipal elections was a bad, bad, bad, bad idea. Given the inexorable decay visible in these polling numbers and the near impossibility of holding a House of Representatives election in either July or August, the tip-tapping over forcing an Asō resignation, opening the way for a new party president to lead the LDP in an October election -- despite the humiliating image that would create of a third consecutive LDP Prime Minister failing to serve in office for even a year -- has become a steady drumbeat. Of course, the Devil is not in the details, but in the premise: who would be mad enough take over the leadership of the LDP at this point? The sorry tale of the misuse of mailing privileges for the handicapped has ratcheted up a notch. TOKYO -- Prosecutors searched Japan's welfare ministry Monday, a day after a senior ministry official was arrested for her alleged involvement in abusing a mail discount system for the handicapped, Kyodo News reported. The special investigation squad of the Osaka District Public Prosecutors Office entered the ministry to search the office of Atsuko Muraki, 53, director general of the ministry's Equal Employment, Children and Families Bureau. Her house in Wako, Saitama Prefecture, was also searched earlier in the day. She was arrested on suspicion of issuing a fabricated certificate to recognize an organization as a group for the handicapped, thus enabling it to use the mail discount system. Now if you are a prosecutor, you do not put a Director-General on ice unless you really have the goods on him. That the Him in this case is a Her, a pioneer (only the fourth woman to reach director status in the Ministry's history) an expert in the issues affecting working women (she offered testimony in Diet committee session only a week ago) and a tough-minded straight arrow long reputed to be on the fast track for Vice Minister status, then you have better have Amaterasu-damned well have your charges and evidence all lined up in the proper order. If the prosecutors have proceeded on hearsay evidence, and do not find documentary support for their claims, then Amaterasu help them. The arrest of a Ministry Director-General on a charge of aiding and abetting a sordid little scheme to defraud the post office -- and a forcible search of the Ministry -- are yet two more black eyes for Health, Labour and Welfare (yes, the pension people) and central government bureaucrats in general. In truth, the bureaucracy could not really sink much lower in the public's esteem than it already has. A poll published in the Tokyo Shimbun this weekend found the public even less willing to trust central government bureaucrats (kanryō) than politicians. I know, I know. I did not think it possible either. The arrest and search are good news for the Democratic Party of Japan, no matter how events play out. If the prosecutors indeed have the goods on the Director-General, then the DPJ crusade against the rule by the bureaucracy, a policy stance the Prime Minister mocked in his first Diet clash with DPJ party leader Hatoyama Yukio, looks prescient. To have a hotshot DG go down for facilitating petty larceny so close to an election is great P.R. for the party that rails against the evils bureaucrats do. If the charges fall apart and the prosecutor's office is revealed to have overreached based on the flimsiest of accusations, then doubt will be cast on the charges the prosecutors filed against Ōkubo Toshinori, the political secretary of former party leader Ozawa Ichirō. T'is a win-win proposition for the DPJ, a party already quite perky from the results of Sunday's Chiba City mayoral election. Unless, of course, the politicians who purportedly leaned on Ministry officials to recognize the fraudulent handicapped group turn out to be members of the DPJ. And the first animal is jettisoned! - Jim Morrison, "Horse Latitudes"
By Takashi Hirokawa -- Japanese Prime Minister Taro Aso lost the third cabinet member of his administration ahead of elections that he must call within the next three months. Kunio Hatoyama resigned as internal affairs minister after Aso declined to endorse his recommendation to fire the head of Japan Post Holdings Co., which runs the country’s post offices and is the world’s largest holder of cash deposits. Tsutomu Sato, head of the country’s National Public Safety Commission, will replace Hatoyama, Chief Cabinet Secretary Takeo Kawamura said. "I decided to leave as the right thing is not being done," Hatoyama, 60, told reporters today in Tokyo. Hatoyama sought to block the re-appointment of Yoshifumi Nishikawa as head of Japan Post after he tried to sell its resort operations to a company whose chairman was involved in the government plan to privatize the postal system. The internal affairs ministry is in charge of overseeing Japan Post’s transition from a government-owned entity. I would give Hatoyama Kunio a milligram's worth of credit for showing some spine, just this once, in resisting the reappointment of Nishikawa -- who did little to earn a renewed mandate (Do you mean by this that he did nothing to earn reappointment? - Editor). I really would give Hatoyama a smidgeon of my respect -- I honestly would -- if he were not the total waste of a Diet seat that he is. Of course with Hatoyama and now Health and Welfare Secretary Toida Tōru resigning from the government in protest, the pundit class will now wonder aloud, "Is this the beginning of the unraveling of the Liberal Democratic Party and the start of the Grand Realignment of Japanese Politics, with everyone in the party entering 'sauve qui peut" mode?" Fitting perhaps it would be if the beginning of the end should come over yet another dispute involving the privatization of Japan Post assets, eh? This Diet saw its birth in Prime Minister Koizumi Jun'ichirō's brilliant transformation of the fight over the privatization of Japan Post into cudgel for the previously disarmed LDP, allowing the LDP to bash the Democratic Party into irrelevance. The prime ministership of Abe Shinzō started its astonishing slide from juggernaut into dust heap with the rushed readmittance of the LDP rebels Koizumi had expelled from the party over their resistance to postal privatization. The local post office -- the LDP's greatest friend and its eternal albatross. "I have insisted that as long as there is a situation where Class A War War Criminals are enshrined there, there is no reason to pay one's respects there." "I want to make Yasukuni Shrine into a place where the Emperor can pay his respects"
...which alludes to the unofficial ban, self-imposed by the Showa Emperor, on imperial visits to Yasukuni following the 1979 revelation of the secret enshrinement ceremony. In case you missed the report. Headline, upper lefthand corner, the morning edition of The Yomiuri Shimbun, June 3, 2009, page 1. Headline, upper lefthand corner, the morning edition of The Yomiuri Shimbun, June 3, 2009, page 2. Like shooting fish in a barrel, it is, sometimes. * GM hatan (chū): saiken keikaku, hogoshugi no kage. ** Nikkō ni saidai 1000 oku en yūshi: seitōgin nado, kongetsuchū ni. Liberal Democratic Party Deputy Elections Chairman Suga Yoshihide traveled to Yokohama yesterday to reassure the head of the Kanagawa Prefecture LDP that when he said he wanted a ban on the children of retiring Diet members running for the seat being abandoned by his or her parent starting with the next election, he did not mean the next election. What he meant of course was the election after next , you know, the NEXT election. So the threat that reformist former prime minister Koizumi Jun'ichirō -- who hopes to hand over his seat to his second son Shinjirō -- should be only one of two political dads dinged by a party reform proposal seems to have been averted. Meanwhile, the Democratic Party of Japan has submitted a Diet reform bill banning relatives within three degrees of kinship from inheriting Diet seats. Given that 1/3 of the current crop of district LDP representatives are inheritors of their seats, the bill has about as much a chance of passing as a ban on alcohol in drinking establishments. Is this an empty legislative gesture inappropriate for a time of crisis? Of course. Good for the fourth-generation-Diet-member-Hatoyama-Yukio-led DPJ's image as the party of change? Certainly. Rely on your own powers. If you cannot see the point of your opponent's move, assume there isn't any. The rhetoric coming out of the DPRK and the wave after wave of provocative DPRK actions are beginning to disturb me. One used to be able count on the DPRK to issue pronouncements that were once snide, defiant and self-pitying. One could also observe the DPRK leadership gearing the provocations up or down in attempt to maximize the country's ability to extort concessions from those engaging in dialogue with it. However, the wilder-than-usual pronuncements and the rush of missile and nuclear tests have an end-of-days insouciance to them. In my nightmares, a dying and pain-wracked Kim Jong-Il decides to go down in a blaze of chiliastic glory, hating everyone and everything and wishing only to make everyone suffer. Would it not be ironic if all the years of trying to overturn the simplistic view of the leaders of the DPRK – that they are crazy and cannot be reasoned with -- in favor of a view of them being shrewd manipulators of situations, brilliantly maximizing the impact of their meager resources and capabilities —- that this grant of grudging respect ends up blinding us to mounting signs of serious stress in the collective behavior of the DPRK? This government pronouncement in particular deeply troubles me. When a government descends to the level of a gross vulgarity, as the above pronouncement seems to, then one has to worry about the possibility that indeed nobody is in charge up there... which would make the examination of an autonomous Japanese preemptive strike capacity seem less of a theoretical examination and more of a possibly necessary option.